A SEPTA commuter train on its way to Trenton on the same Northeast Corridor tracks as the ill-fated Amtrak northbound train has made an emergency stop moments before the wreck after an unknown projectile hit and cracked the engineer’s window. As SEPTA passengers waited, they could see the Amtrak train roll past on another track. Marcus Carbo, of Northeast Philadelphia, was on stalled SEPTA train 769 when word of the derailment up ahead began making its way through his rail car as passengers scoured social media. SEPTA spokeswoman Jerri Williams confirmed the emergency stop of the SEPTA train carrying Carbo and about 80 others Tuesday evening. An investigation into what the object was that hit the window is ongoing, Williams said, adding that "there is no indication at this time that the two incidents are related in any way." On Wednesday, Carbo recounted his experience sitting on the stalled train miles from the wreckage site for several hours and sharing news from social media with the strangers surrounding him. As news of the Amtrak derailment began to circulate through his halted train, the mood in the rail car suddenly turned from irritation at the extended delay to somberness. One woman was in hysterics, he said. Others were glued to their phones and relaying new information out loud. “It was really weird. Something had struck the window, so we couldn’t go anywhere, and that’s when reports starting coming in about a derailment,” Carbo said Wednesday. Last night #Amtrak188 passed my train on the parallel track just before it derailed. Had we been moving, this tweet wouldn't be happening. 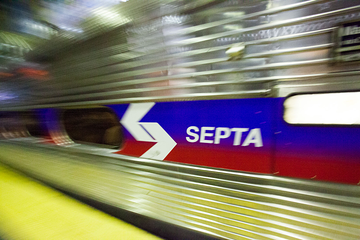 The projectile hit and stopped the SEPTA train at about 9:25 p.m., Williams said. At around 11:30 p.m., SEPTA officials escorted the passengers from the train by foot, with buses waiting to take them to safety up ahead beyond the wreckage site. An investigation into both the SEPTA incident and Amtrak derailment is ongoing.